In keeping with the extensive public sector experience of the members of the Firm and the Firm’s areas of expertise, Whiteman Osterman & Hanna has undertaken legislative and regulatory representation on behalf of a select group of clients. The nature of the Firm’s government relations clients closely mirrors the Firm’s expertise in financial services, health care, education, and environmental representation. The Firm provides government relations services to such diverse clients as American Express, CarMax, ETS, Distilled Spirits Council of the United States, Amazon, Hertz, Johnson & Johnson, Scotts, and TIAA. Our ability to bring the Firm’s areas of expertise to bear for regulatory and legislative clients is one of the Firm’s unique strengths. The Firm represents government relations clients before the New York State Legislature and the executive branch of the government of New York State, including such agencies as the Education Department, the Department of Health, the Insurance Department, the Department of Taxation and Finance, the Department of Environmental Conservation, the Office of General Services, the Public Service Commission and the Office of the Secretary of State. Based in Albany, New York, Whiteman Osterman & Hanna has established professional relationships with key legislative and regulatory officials and maintains a well-earned reputation for credibility and integrity. 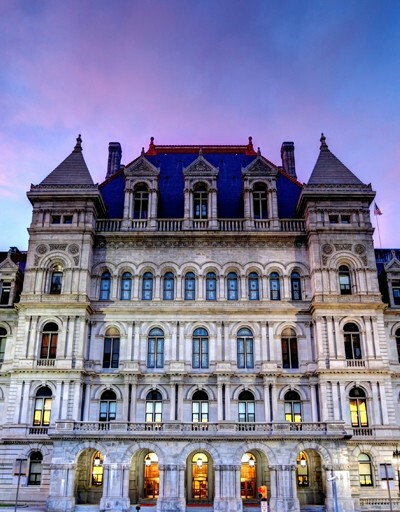 Our government relations practitioners include high level advisers to the Rockefeller and Cuomo administrations, and a former counsel to the Speaker of the New York State Assembly. This wealth of government knowledge and experience is brought together to advise and solve our client’s concerns before government. We offer the constant legislative contact that a full-time Albany lobbying presence provides. We also are able to provide a full range of executive branch, legislative and regulatory representation. We draft, identify and monitor key legislation and regulations and advocate passage, secure funding and, most importantly, we provide constant communication with the client as issues of concern become more important in the legislative or regulatory process. Should Ethics Reform Be in the New York State Constitution? Our ability to bring the Firm’s areas of expertise to bear for regulatory and legislative clients is one of the Firm’s unique strengths.